(Nanowerk News) Engineering researchers at Texas Tech University have developed a method for characterizing the surface properties of materials at different temperatures at the nanoscale. Knowing properties of materials at different temperatures is important in engineering, said Gregory McKenna, a professor of chemical engineering and the John R. Bradford Endowed Chair in Engineering. For example, the rubber O-ring that failed during the 1986 space shuttle disaster serves at a tragic case study of what can go wrong when decision-makers don’t take this into account. The problem, he said, is known properties of a material can radically change at the nanoscale. McKenna and graduate student Meiyu Zhai looked at several polymers and explosive materials to see how surface properties varied at the nanoscale and how the surface impacts the nanoscale properties. Their first results on the “multi-curve method” appeared in the peer-reviewed journal, Journal of Polymer Science Part B: Polymer Physics ("Viscoelastic modeling of nanoindentation experiments: A multicurve method") and was highlighted in Advances in Engineering. 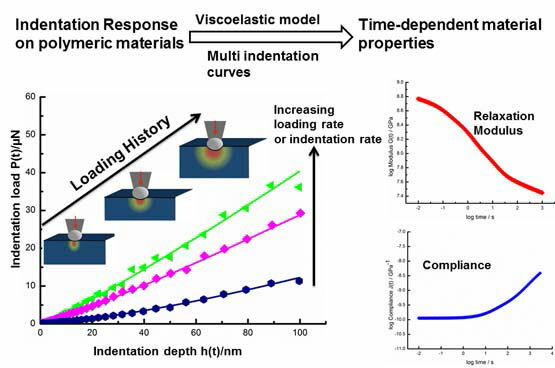 In nanoindentation, researchers can investigate both the elastic properties (how materials spring back when pushed) or the viscous properties (how the material flows). The group has found several surprising results: For example, in other work, the team found extremely thin polycarbonate films become liquid-like at the nanoscale, while they are glassy at the macroscopic size scale. Nanoindentation can be used to relate surface properties to this observation. As machines get smaller and smaller, McKenna said, knowing this information can be invaluable to future engineers.